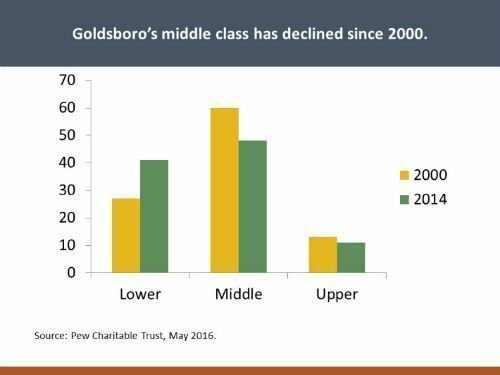 In 2016, Goldsboro was identified in national research as experiencing one of the greatest declines in its middle class in the country (Pew Research Center, 2016). From the report: “the share of adults who are middle income fell from 60 percent in 2000 to 48 percent in 2014…one of the greatest decreases among the 229 metro areas analyzed.” The share of adults in lower income households also increased sharply over the same period. 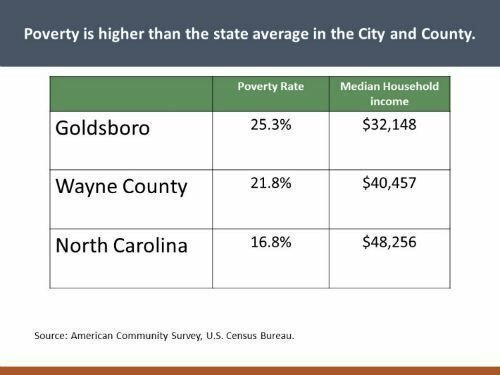 Similarly, the latest available US Census data shows 21.8 percent of residents across Wayne County AND 25.3 percent of Goldsboro city residents living at or below the official federal poverty rate of $24,000 a year for a family of four. But as if that weren't bad enough, consider that 1 in 3 children in Wayne County live in poverty while among minorities, those ratio becomes nearly 1 in 2. 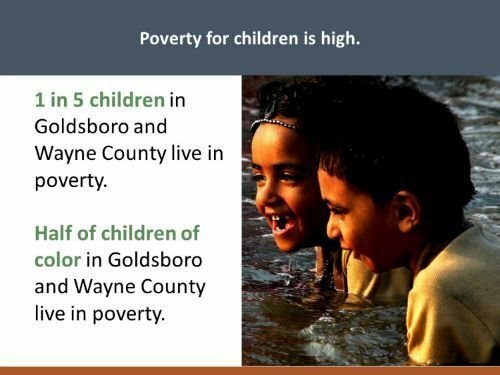 This cannot continue - not if Goldsboro and Wayne County are to grown and become healthy, economically competitive places with opportunity for all. This is why the WAYne Forward coalition was formed as a grassroots effort to begin a community discussion of these causes and symptoms of poverty, the priorities of what needs to be addressed and the potential solutions for how to address those. This is a community effort, driven from the bottom up up. We want your voice to be part of this process. 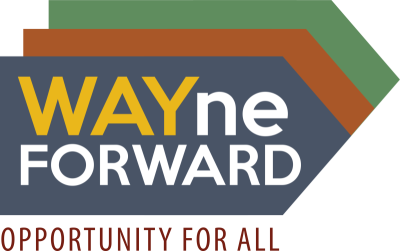 With our first year nearly behind us, WAYne Forward released its yearly progress report and priority list in November. We realize this is not a comprehensive list of everything that needs to be done to combat poverty, but it is a starting point to address the concerns that were voiced by the community, and it is where work will begin in 2019. We hope you will join this effort. We will take a strength-based approach. We will conduct an inclusive process. We will recognize that we are all in this together. We will hold each other accountable to the activities and milestones we have established. We will build on existing assets. We will hold the preservation of humanity above all else. We will foster a supportive environment. We will build bridges and deconstruct barriers. Public understanding and will to support solution to poverty increased. Sustainable solutions formed and established in systems. Improved living conditions for residents. Increased treatment for mental health problems for those in poverty. Improved mindset of those in poverty and of the broader community. Systemic disparities and oppression addressed. Identification and creation of policy solutions. Identify the various kinds of poverty.